I was born and raised in Leicester,England. I lived in France for 17 years with my wife, and started to paint and draw seriously, ten years ago. I returned to Oakham in Rutland in 2018. I am influenced by artist friends and life in France. One artist I greatly admire is David A. Leffe. I paint in oil and am passionate about pencil drawing. I enjoy painting with friends at weekly workshops. I am totally self taught. 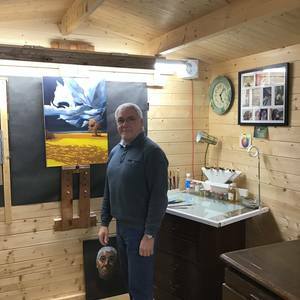 I have exhibited in several venues in south west France and have sold a number of works.